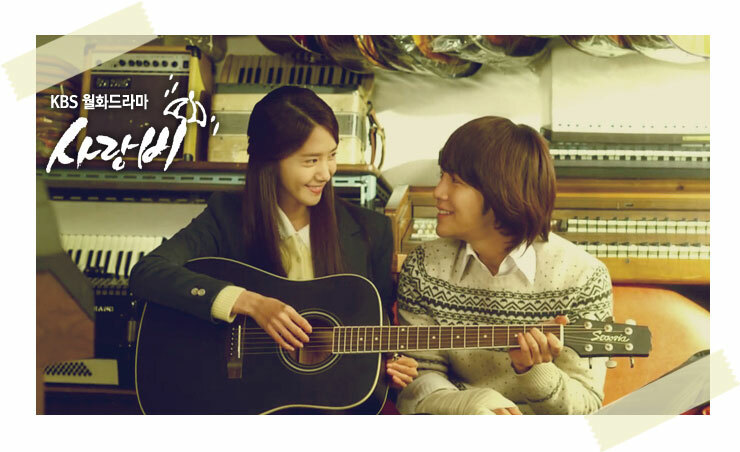 In KBS 2TV drama series Love Rain, 2012’s Jang Geun Suk and Yoona are staging the fate the is the same with 1970s era. Seo In Ha, Kim Yoon Hee of 1970s, and Seo Joon, Jung Ha Na of 2012, the love in two eras has too many similarities, causing people couldn’t help but sighs with regret that love has no time constraint, all the love is connected. In 1970s, In Ha (Jang Geun Suk) falls into the ‘3-second’ love spell of innocent campus belle Yoon Hee (Yoona). After that, the son of Jae Ha who is known as ‘courting girl in 3 seconds,’ Seo Joon, is tempted by Ha Na (Yoona) who seems like jokingly counting “1 second, 2 seconds, 3 seconds” to seduce him, indicating that the two will commence the destined love shortly. The reason that made In Ha falling in love with Yoon Hee on their first encounter is precisely the yellow diary of Yoon Hee. And the diary changed into Ha Na’s mobile phone when came to electronic era of 2012. Diary and mobile phone, the items that highly valued by Yoon Hee and Ha Na, are the medium that spreads the love, as if controlling by hand of destiny. The romantic declaration of love “? !” of two eras is exactly the same. On the East China Sea-bound train’s window, In Ha wrote, “Do you happy?” While Yoon Hee romantically answered with, “!” to complete the declaration of love with tacit understanding. 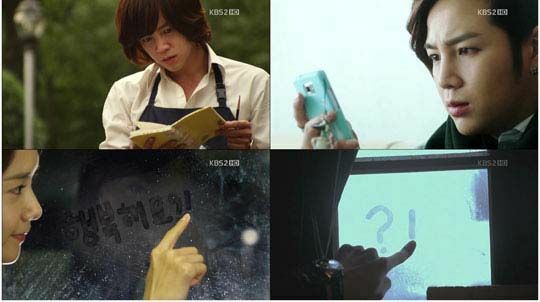 Many years later in Hokkaido, Seo Joon and Ha Na also wrote “?” and “!” on the window, indicating that the romantic romance of the two will be staged. In addition, the line of ‘love does not say sorry’ in American movie “Love Story” watched by In Ha and Yoon Hee in the 1970s continues to make its debut in 2012. So all the common ground, it’s creating a love story deriving from common origin in two eras. In the episode 7 of Love Rain broadcast on April 16th, 2012, the scene of Seo Joon saying to Ha Na, “Let’s end it,” is making a surprising reversal turn in the plot, and the subsequent “Let’s start all over again” is making audience put down their worry. The sweet love of two people is about to be staged.